According to my digital angle gauge, it's 7.8 degrees. I did try a bunch of maths, but in this case, the universe disagreed (this might be because my desk is not totally level, I am not sure, trig suggested an answer of 8.297 degrees = tan-1((7/2) / 24), assuming the ratio really is 7 in 24. After way much googling the closes i found was this Angle = atan(7/24). but in the case with the BT40 holder i cant seem to figure out if its included angle or not.. if its included that would be *2.. Unfortunately, Machinery's Handbook completely glosses over any British Taper standards, mentioning only the BS Standard number (1660) from 1972. It does go on to mention that the National Machine Tool Builders Assoc. chose a 3 1/2" per foot taper to be standard on milling machines as far back as 1927... i.e. 7/24. so I think we can be reasonably certain that's the BT40 spindle taper. The above is wrong, see Marv's post below, which is correct! and the taper HALF ANGLE is half this value = 8.130... deg. arctan (7/48) = 8.297 deg. Being a bit of a duffer when it comes to trig, I find this calculator quite useful: http://www.cleavebooks.co.uk/scol/calrtri.htm (if that offers you options, go for Right Angled Triangles). Put sides a and b in as 3.5 and 24 (it doesn't matter which is which) and it gives you two angles, the one you want being 8.3 degrees. Then if you have an amazing protractor and even more amazing eyesight, crank it up to (say) 7 significant figures and that becomes 8.297145 degrees. The included angle will be double that, of course. Oops, you're right of course, my bad. I think I now understand why I have been utterly unable to cut the taper for my lathe headstock... (see posts I made about 3 years ago). 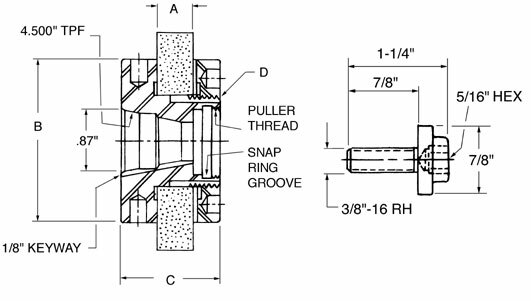 Tapers that are specified in inches per foot are best set-up using a displacement and length. Converting to angle will always produce an error. If you are trying to cut the taper with a top-slide, either set the angle with a sine-bar* or dial in on an existing taper. This may confuse you - but that's OK because at the moment it's just me that's confused. Russell - that's what I thought.... but the reason we're wrong is actually relatively easy to show using a diagram; see attached. The first figure shows the full 7/24 taper. The included angle between b1 and c1 (from an imaginary point at the rear of the taper) is arctan(7/24), or 16.whatever degrees. If we halve the taper angle, to 7/48; we get the 2nd figure. Now the included angle between b2 and c2 is 8.3 degrees. However, if we rotate the taper so it sits flat on baseline a; you can see it no longer forms a right-angle triangle; and thus, our trig rules go out of the window.. Indeed, it should be clear that if you halve the b1/c1 included angle, you end up with the actual angle of taper; that is the angle between a and b1, or a and c1. Fascinating topic full of good info many thanks. this equals 7 inch to 2 feet, twelve inches to the foot, some times quoted as 3 1/2 inch to the foot but I don,t think it works quite right that way as AdeV says. Whatever a very interesting topic. this is why im asking..
Dont think for 1sec, just coz you know cad, your gonna do it right. Gage line (diameter of large end) = 1.7500"
As Bill says, you don't need to know the angle. Not having a sine bar, I would arrange a plunger indicator lying flat and with the plunger at exactly 90° to the lathe bed, and the plunger touching the side of my top slide. I would then set the angle of the top slide so that, when the carriage is moved along by 24 units, the dial indicated a variation of 3.5 units. The greater the distance over which the measurement is taken, the better. My top slide is 120mm long, so I would look for an indication of 14mm over a carriage movement of96mm. 14:96 is the same ratio as 3.5:24. It is easier to measure distances precisely than to measure angles accurately, though the dial indicator stil has to be set horizontal and at 90° to the bed. Alternatively, you can set the toolholde up to run true on your lathe, and adjust the top slide angle until a DTI mounted on the top slide with its finger at centre height shows no movement as it is run along the taper. The top slide should then be at the right angle to bore the taper in your spindle, using a tool at centre height. I think you were right the first time - I've attached a diagram. The triangle ABC is the taper we are trying to make. It starts 7 units wide and over a length of 24 units tapers to 0. (I've drawn it to a point to make it easier to visualise). The triangle ABC has no right angles so we cant simply apply arctan. We need some extra lines. To get the included angle we could draw a centre line from the midpoint of AC to B to give us two right angled triangles. They would be the same shape as the triangle BCD and the angle would be arctan(BD/CD). So the included angle is 2arctan(BD/CD) and the angle to set your topslide to is arctan(BD/CD) or in this arctan (3.5/24). I hope I've got that right. You woud need to know =exactly= the spacing between the two indicators, and you would have to align the beam parallel to a test bar (not just in&out but also in height at both ends so that probes touch on the same point of the circumference) - seems like adding extra complications and extra opportunities for errors to creep in. To address the real issue, rather than just the maths, the most important thing you need is some way of testing the taper without removing it from the lathe - for example a suitable socket. You set the angle to about 8 degrees and cut the taper, then try the socket and see which end is loose and adjust the angle to suit. Repeat until it's right. It's fiddly rather than difficult. This was very educational anyway.. These ratios for angles is not anything one learn in school anymore.. not me at least. If Finland has the same road signs as most of Europe, Neotech, they use a similar system for gradients on hills. For example, "20%" means a gradient where you go 20 units up (or down) for each 100 units you travel horizontally, as viewed on a 2D map. 20:100 could be expressed as 1:5, and life was simpler here in the UK when the signs said things like "Steep Hill 1:5" which was pretty steep. When they said "1:3", things got very steep. Going up a long hill your engine coolant might boil. Worse still, your brake fluid might boil coming down, so you travelled rather fast near the bottom of the hill. Helpfully, the sign for a steep downward hill also said "Engage low gear now". These ratios for angles is not anything one learn in school anymore.. not me at least. You must have use Radians in school surely? I suppose that as schools try to teach kids more and more 'stuff', the greater becomes the danger of missing out on the fundamentals . Chopping a circle up into an arbitrary* number of degrees is ancient and must be almost as old as describing an incline in terms of height and distance. 1 minute = 60 seconds etc etc. It's primary use is for quick, in-the-head*, maths for navigation. Powers of 60 factor (i.e. can be divided exactly) by 2,3,4,5,6 etc. making division by those factors easy and accurate. eg. 25° 34' 18" divided by three = 8° 31' 29"
The same units are used on charts and navigating instruments so there's no need to convert. *fractions (e.g. of an inch) have some of the same 'magic' which is why they been around so long - It's only the wide spread use of calculating machines that makes metric/decimal systems attractive. (25° 34' 18")/3 = 8° 31' 26"
Where's the kicking-oneself-up-the-arse emoticon ? Knowing this, I check every computation in a forum response three ways to Sunday yet I still manage to bugger up a few. It's the math gods' way of keeping us humble. No need to feel to bad, We all make them once in a while. I was sitting back at the original post trying to figure out in my head how to do it and couldn't get it to work out. I figured that I must have forgot how to divide degree's. Now I know it was a trick question just to see if we were all paying attention. So, this is the bugger: 4.500" TPF big end is 0.87"
Great. I assume that 4.500" TPF stands here for included angle, which ratio is 4,5" for 12,0" and half angle would be 2,25" displacement at 12" distance? Is this correct and if not what actually then this 4.500" TPF stand for and what it is when setting the machine to do this taper? I think I know but after reading this thread and being raised on ratios of half angle I am having this WTxxxx moment. Hi Pekka, Abom79 shows an accurate way to set up for a taper. He has a taper attachment but still uses a method to check accuracy which is valid for setting a compound too. It starts at aound 18 minutes in. Basically my question is that is this TPF just a straight ratio on orthogonal coordinates, no funky stuff here? The funky part is that it is included angle i.e divide by two to get something usefull? Graham, Abom79 vids are allways worth checking. Thank you. Another person that makes a lot of stuff very clear is that al-bundy looking guy that sounds like my physics professor...what was his name Piezak or something. Spot on, without too many practical omissions. I thought a video might be worth a thousand words. I only watch some of the youtube lot, I get bored with some where they waffle on with a bit of practical in between but I like Joe P, he does short and to the point vids.